Ever since the first Falcon 900 was developed in 1983, Dassault’s Falcon 900 series has endured many upgrades and enhancements. 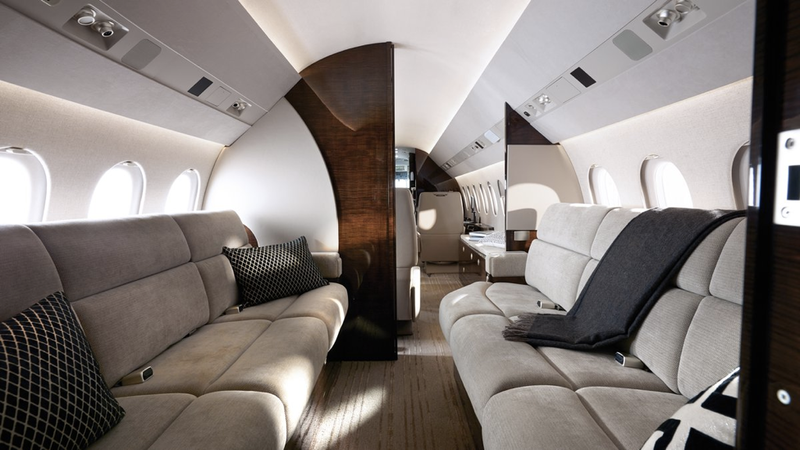 The newest large cabin trijet is one of only two trijets in production by Falcon, and was certified in 2010 after its announcement at EBACE in 2008. The 900LX’s redesigned and upgraded cabin features three zones that comfortably seat 12 to 14 passengers. Standard configuration of the cabin features a single-club seat section, four-place conference seating, and double divan living area. 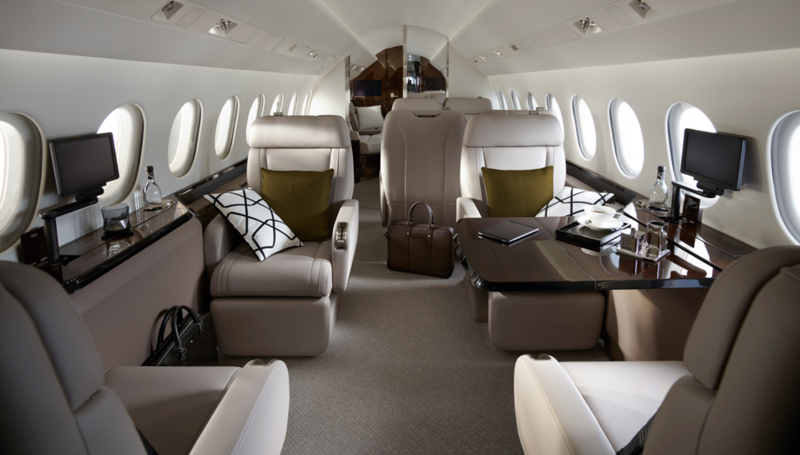 Dassault’s interior design creates an alluring look with the use of mixed materials throughout the cabin. Buyers of the 900LX are able to create an interior and color scheme that reflects their personal taste and style. Offering comfort and convenience, the stand-up cabin is easily maneuverable at 7 feet 8 inches wide and over 6 feet in height. Soft leather seats offer recline and berthing capabilities. Cabin management controls are subtly hidden within the seat’s armrests, allowing travelers to seamlessly adjust cabin settings without needing to leave their seat. Additionally, the 900LX has a unique and innovative mood lighting system that allows passengers to create the atmosphere and ambiance they choose. With 12 closely spaced windows on each side of the aircraft, natural light easily flows into the cabin. The large jet is equipped with user friendly entertainment tools for passengers that increase connectivity while in the air. The cabin is also the quietest in the entire 900 series. Capable of traveling up to 4,750nm, the 900LX can fly non-stop from London to Seattle, New York to Moscow, or Paris to Beijing. The 900LX is the only jet in its class capable of picking up additional passengers before continuing to intercontinental destinations without needing to stop and refuel, getting you where you need to be in less time. Flying at a maximum altitude of 51,000 feet, the Falcon 900LX has large blended winglets that help it stand out from previous 900 models, such as the EX or DX. These winglets reduce drag and improve climbing performance. The most distinguishing feature for this jet however, is the three engine configuration. The additional engine not only improves runway performance, but drastically increases safety when flying over oceans and harsh terrains for long periods of time. Three engines also enhance fuel economy by 40% compared to competing aircraft. The 900LX is easily maneuverable on the tarmac, giving it ramp appeal. The jet also requires less hangar space than other aircraft in its category. The Falcon 900LX is powered by three Honeywell TFE731-60 engines, each providing 5,000 pounds of thrust. This contributes to the aircraft’s extraordinary low fuel burn and low cost of operation. 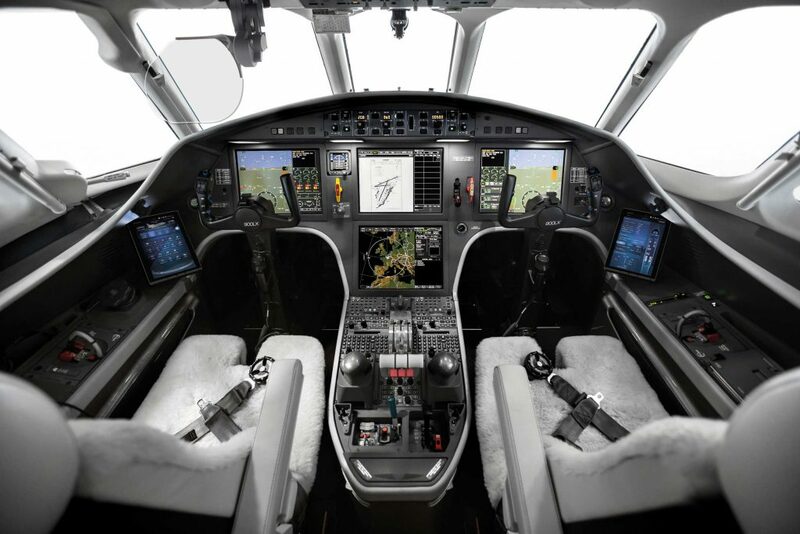 The cockpit is equipped with Dassault’s second-generation EASy II flight deck as well as the Falcon Cabin HD+ cabin management system. 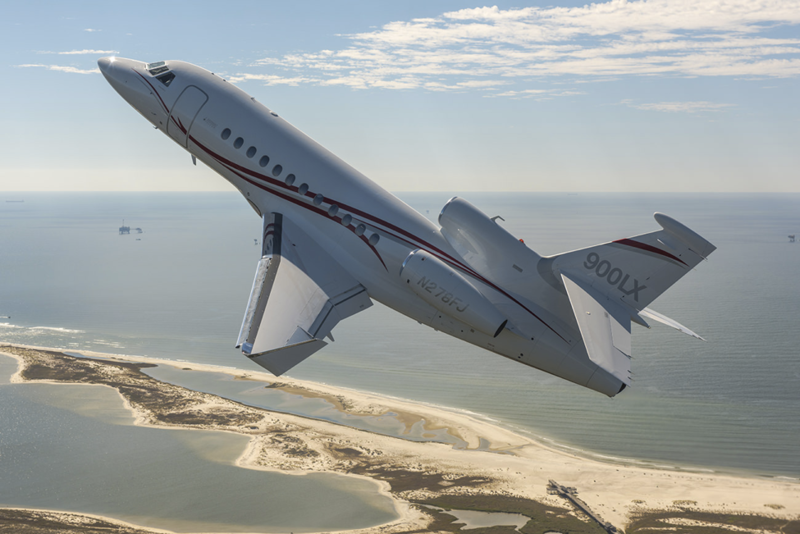 Advanced aerodynamics and progressive flight equipment make the 900LX one of the most innovative jets on the market. Dassault’s Falcon 900LX is the most revolutionary version within the 900 series. The addition of a third engine not only improves speed and power, but saves passengers time, money, and fuel. The 900LX has set numerous records for reliability, flexibility, and fuel economy since its introduction into the market.